This is a beautiful soft pink fluffy-looking tulip that flowers in late Spring. Many species of double tulips aren’t perenial but Angelique is and will naturalise nicely*, as long as you plant it good and deep and ideally leave a couple of leaves on when cutting the stems. They're perfect for pots and I'm planning to plant mine between my astrantia plants, as they'll be nice and tall before the herbaceous foliage takes over. Cut when the bud is starting to show colour and you'll get a good week of vase life. *Though like all tulips, you will get better results from starting with new bulbs each year. If you wanted a reliable crop for market that would be a no brainer, but I'd rather get them established and not have to do too much digging! Daffs are the absolute classics of spring flowers, and there are many varieties that blow the classic yellow trumpet out of the water. Compared to tulips they are relatively cheap bulbs that give beautiful flowers and establish themselves quickly - I like to put them in areas of long grass or along fence lines, they don't need to take up valuable bed areas. Plant lots of white to combine with hellebores and viburnum - 'Paperwhite' (below) is a beautiful single variety and 'Bridal Crown' is a wonderful double. A large bag of mixed double daffodils would also be a very worthwhile investment. I think alliums (ornamental onions) are one of the loveliest spring bulbs, their jaunty globes bobbing in the wind always make me smile, and they give the added value of beautiful seed heads. The flowers can be heavy so plant fairly deep to anchor them against strong winds, and ensure you underplant with something complementary as bare soil is just asking for weeds! I'm planting sedums in my patch which will provide good ground cover and interest for the rest of the season when the alliums have died back. When left to naturalise they can quickly become a bit of a pest which is ideal for a cutting garden, but if there are too many simple pull the whole bulbs up when harvesting some of your blooms. Their strong smell means they're not the best for flower crowns or to use en masse, but a few sprinkled throughout and arrangement can be lovely, and that smell can be useful too, helping to deter aphids in the cutting patch. 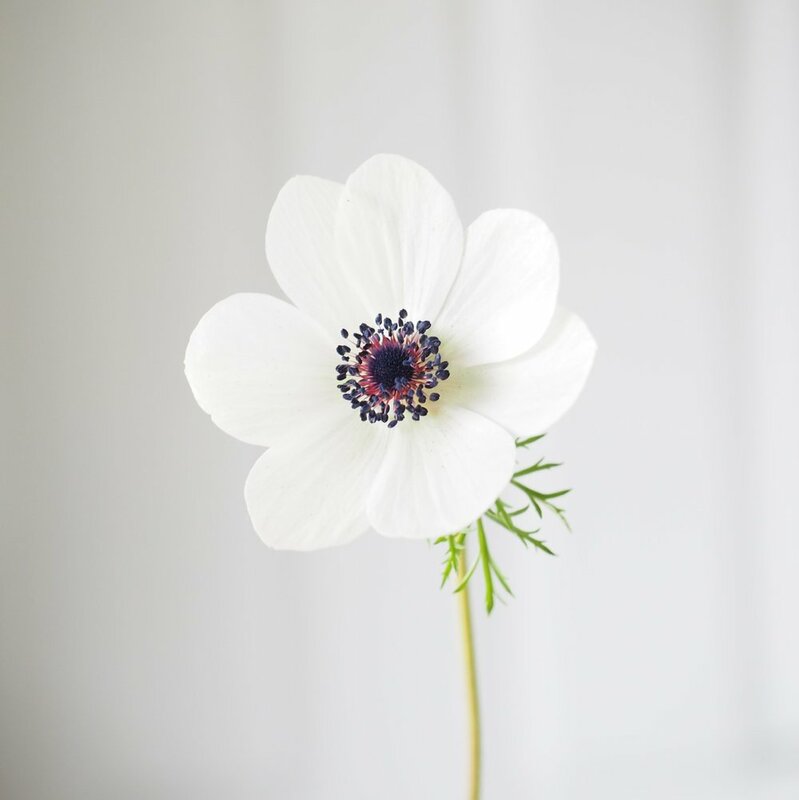 Anemones are one of my absolute favourites in all the categories of flowers I grow and use. Their delicate, tissue paper petals and open faces are just so charming and it always feels a little bit magical watching the tiny, hunched buds unfurl into beautiful blooms. They are also incredibly easy to grow. Soak the corms for a few hours and then plant a couple of inches deep. A small forest of ferny foliage will emerge first, followed by a profusion of flowers - anemones, unlike many of their contemporaries, will flower again and again over the season, provided they are well fed and watered. The 'de Caen' family are stalwarts for the cutting garden, although I would warn against buying mixed packs as they are always very red-heavy - wonderful for 3 days in mid February and fairly useless for the rest of the season! 'The Bride' is a lovely white variety and there are also some wonderful pinks and blues. I love this photo of the first anemone from back in the Spring - they're so delicate but last surprisingly well as a cut flower. The Christmas classic - this is the perfect time to get hold of inexpensive amaryllis bulbs and pot them up for flowers over the winter. They make wonderful gifts and when cut you only need one in a bouquet to make a big impact. Try growing them in the dark and bringing into a light spot after a few weeks for really impressive stem length! Be nice to your bulbs - feed them, let them die back when they're finished and then keep cool and dry for a couple of months to let them have their dormant period before starting again! It's hard to pick a favourite as there are so many incredible varities, but there's something rather special about 'Apple Blossom' - not one I've grown as yet but I'm on the look out for some reasonably priced bulbs! A candy-striped Amaryllis is the stunning focal point of this spring bridal bouquet. Ranunculus - slightly trickier to grow but so beautiful it's worth the pain! Small rosettes of layer upon layer of delicate petals, an essential for the farmer florist for springtime bridal work. Muscari - the simple grape hyacinth is so easy to grow, spreads like wildfire and adds a lovely touch to early Spring posies. It pairs wonderfully with biennial forget-me-nots and can get to a surprisingly long stem length. They are also available in whites and purples. Now is the time to be planting your bulbs so keep an eye out in garden centres, supermarkets and markets - Wilkinson's also has an extensive range which is very reasonably priced. Make sure the bulbs you're buying are firm and dry with no sign of mildew, and plant them as soon as possibly after getting them home. Then sit back and relax, knowing that come the spring you're going to have a garden full of colour!